The following topic describes all the visual elements and terms used in a standard RadGauge control. The RadGauge is the graphical representation of a numerical scale. Additional functionality of RadGauge comes from its Indicators. Label: This is the visual representation of a value on the gauge scale. Marker Indicator: This is an indicator which is usually placed somewhere near the gauge ticks and is used as a label for a special value. Arrow Indicator: Represents an indicator in the form of an arrow with a circular tail. Bar Indicator: This is an indicator which can show progress or value range. 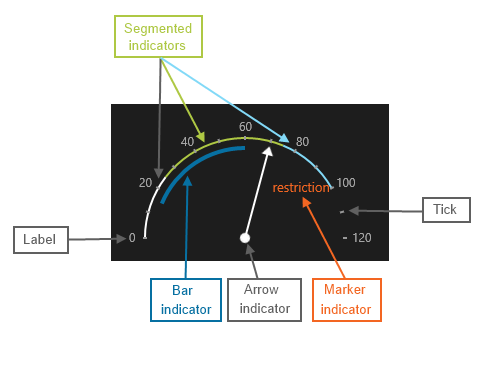 Segmented Indicator: This is an indicator with segments that represent different value ranges.